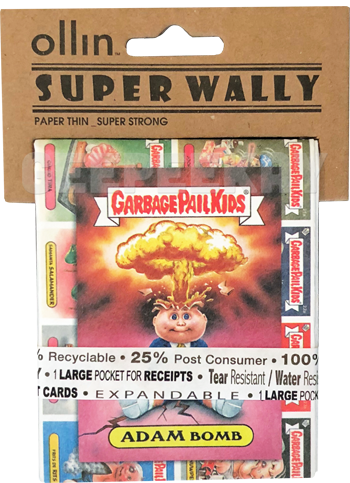 The Super Wally wallets from Ollin are an extremely random Garbage Pail Kids collectible. They were never advertised...they were difficult to locate...and they seemed to appear and disappear without much fuss from fans. 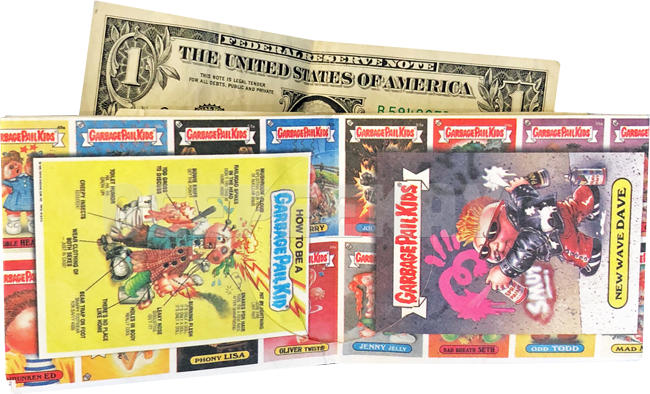 What's even more strange is that (aside from the obvious GPK images being used) there is no Topps, Inc. copyright information on the packaging or wallet itself. This makes the wallets appear as if they are not an officially licensed product, even though most believe they are in fact official. Regardless, they are a fun addition to any collection - and feature some of the most popular GPK images from the 80s. In fact, this is the only merchandise I can think of that incorporated characters from the Garbage Pail Kids Posters and Giant 5x7 cards in their design! Below are images of how the wallets come packaged...folded through a piece of cardboard with a paper ribbon slid on to keep it closed. Each wallet contains "1 large pocket for cash, 1 large pocket for receipts, and 2 pockets for business/credit cards". And even though they are paper thin, and made of recyclable material, they are in fact 'super strong'! 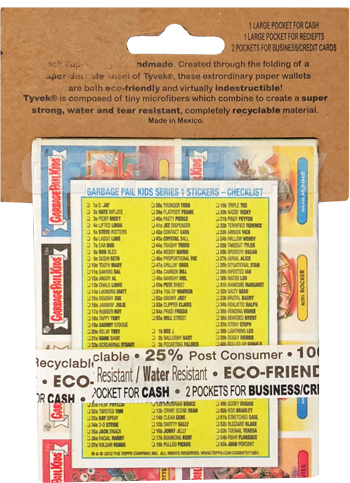 As mentioned above there are a total of SIX different variations for the Garbage Pail Kids Wallets. Aside from the images the wallets are identical, and feature the same number of pockets, etc.